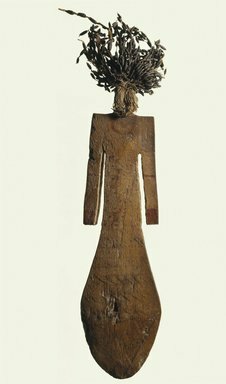 Painted wooden doll with hair of mud beads. The doll is of conventional Middle Kingdom type with square shoulders and rounded base. The decorations on the front are in red and black with a large triangular design painted at the base. On the back is painted a small demonlike creature in bright red. The hair is composed mainly of small tubular mud beads but there are included a few small bright blue faience beads. This type of object is well known although sometimes referred to as dolls and other times as servant figurines of concubines to be placed on the tomb. Condition: The paint is faded and worn, the edges are chipped.